Congress, in response to national concerns over mounting erosion and dust storms, enacted the Soil Conservation Act of 1935. The conservation district concept was developed to enlist the cooperation of landowners and occupiers in carrying out the programs authorized by the act. To encourage local participation in the program, President Roosevelt sent all state agencies a State Soil Conservation District Law. By the late 1940’s all states had adopted similar legislation. Forming a conservation district in Franklin County was not a readily accepted idea or an easy task. Five men who had the insight and felt there was a need to conserve the land took up the challenge. 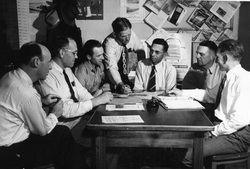 These five men were: Leslie Hunter, Harry Funk, Chester Wagner, Harry Scott and H.M. Ward shown in the Conservation Districts file photo to the right. organizing and assisting the new districts. Each district has a governing body of five board of supervisors who are elected by local landowners and serve three year terms. They share their experience and knowledge of community needs to guide the district in setting goals and priorities for carrying out resource conservation programs. Those who have served the district as supervisors include: Edward Altic, Roland Bromert, C B Coughenour, Stephen Curtis, Andrew Duffle, Albert Dunbar, Ronald Dunbar, Karl Eisele, Bernard Fischer, Leon Freese, Grover (Steve) Froggatte, Harry Funk, Galen Harris, Edwin Horstick, Leslie Hunter, H Arlon Jones, Dwayne LaGalle, Darrell Macy, Dean Martin, Joe McAuliffe, Willie (Bill) Miller, Lawrence Murphy, David Nelson, Lloyd Nelson, J Harry Peckham, Arthur Rockhold, Cecil Rockhold, Harry Scott, Doug Smith, Donald Steward, Dale Van Horn, Gene Van Horn, Harold Van Horn, Cecil Vining, Chester Wagner, H M Ward, Victor Warren and Clayton Watts. Leslie Hunter served the local board for 35 years and served as president of the Kansas Association of Conservation Districts in 1960. He also served on the Marais des Cygnes Drainage District board and ASC Committee. Albert Dunbar also served on the board for 35 years. Albert represented the district on the RC&D Council, Franklin County Planning Commission and by attending many state and national conservation conventions. Pictured above left are Leslie Hunter and Albert Dunbar. An annual meeting is held each January to report district activities and accomplishments; the meeting is open to the public and is typically held the last Thursday of January. An election is held during the annual meeting to fill one or two (depending on the year) three year terms for position of board supervisors. The Kansas Bankers Association (KBA) Awards have been part of our annual meeting since 1945. The purpose of the Banker Award program is to stimulate a greater interest in the conservation of the agricultural and natural resources of Kansas by giving recognition to those farmers and landowners who have made outstanding progress in practicing conservation on their farms. “The continued work and dedication of our award winners each year provide the example of conservation practices that we all need to follow. The land is our long term asset and the proper maintenance of it will help determine our future success and the successful opportunities of the next generation”, said Mike Skidmore, 2010 Key Banker. The KBA works with K-State Research and Extension and the Kansas Department of Wildlife and Parks throughout the State to sponsor six award categories including Energy Conservation, Water Quality, Water Conservation, Soil Conservation, Windbreaks and Wildlife Habitat. We have a complete list of award winners dating back to 1945 in the PDF file below. Your local conservation district remains a vital part of the Franklin County community and is here to help people who want to do their part in caring for soil and water resources. Like our partners at USDA-NRCS, we are here to help people help the land for the conservation of our natural resources for the future.